This stylish keychain is made of molded metal and has a shiny gold finish. 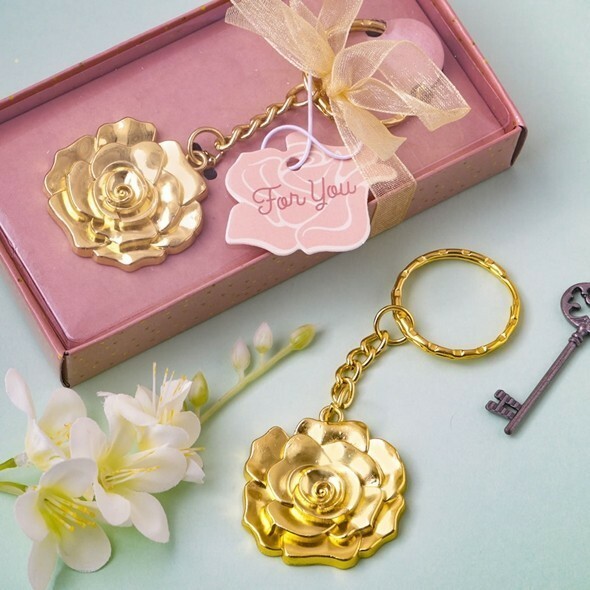 It features a 3D rose charm that is attached to a gold metal keychain and gold keyring. Each favor comes packaged in a display-topped mauve gift-box with a gold dots design. The box is finished with a gold organza ribbon and bow. Attached to the bow is a matching pink rose design 'For you' tag. PLEASE NOTE: Pictured key is not included. Sold individually.